The main preview screen is where the preview magic happens. From the top, you can see the main menu bar. You’ll practically never need this unless you prefer words instead of pictures. On the left, top of this screen is the Elements Tree. 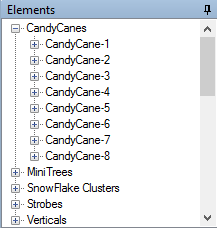 This is a duplicate of the elements tree you use to setup the Display Elements & Groups. Below the Elements Tree are the properties for the currently selected display item. And, on the right is the stage. This is where you will do all the work to setup your display preview. As you add items, you’ll do it in this area. The toolbar is used to tell the preview what you want to do. There are various groups in the toolbar. To set the preview background, click this button. See the Background Image section for more information. Clicking this button puts the preview in select mode. This cancels any other item you may have selected. The basic drawing tools group the simple drawing tools for easy access. See the Basic Shapes for more information on how to use these items. The more complicated items are grouped in the Smart Objects area. These are props such as your Mega Tree and Stars. For more information see Smart Objects. When you’re done editing this screen, click Close. To save your changes, click OK on the Previews Configuration dialog. If you made a huge mistake and want to lose your changes, click Cancel on the Previews Configuration dialog box. The Element Tree is the same tree used on the Display Elements & Groups screen. 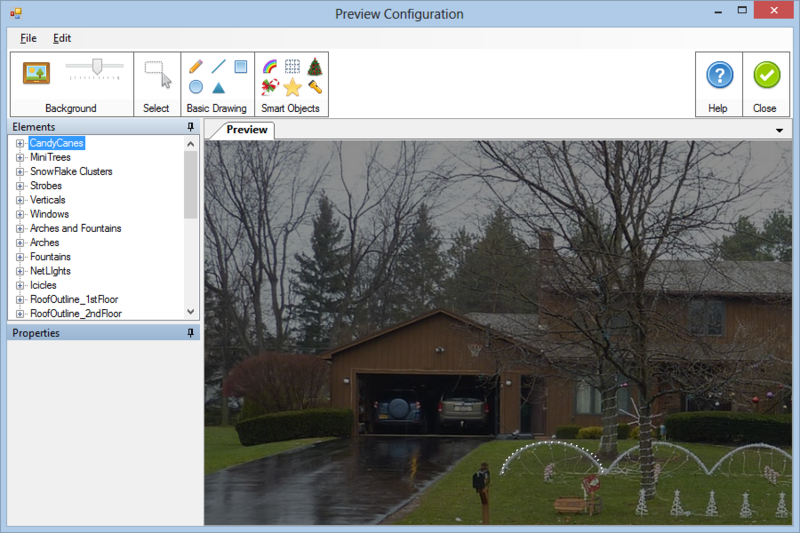 The easiest way to setup your preview is to first, setup all of your elements and groupings and then add those to the preview. For the purposes of setting up elements, building a preview and then sequencing your display, you can skip the Configure Controllers section. What’s the easiest way to add an item to the screen? For more information have a look at the Linking Elements Screen. Display items all have properties associated with them. 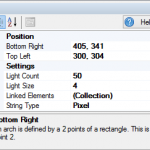 Along with multiple common properties, some items have custom properties that can be set. 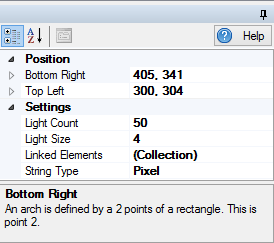 See the Basic Shapes and Smart Objects for more information on how to use these properties.